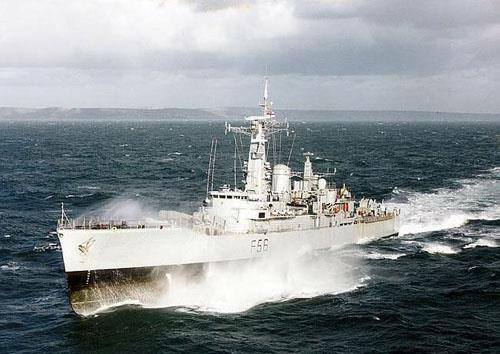 Today in Gosport’s Past:- on 25 January 1995, ‘Leander’ class frigate F56 HMS “Argonaut” was towed from Portsmouth harbour to Spain for breaking up. 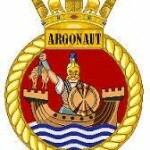 “Argonaut”, the fourth Royal Navy ship to carry the name, was launched on 8 February 1966 at the Hawthorn Leslie & Co shipyard on Tyneside, and was commissioned on 17 August 1967. One of her duties during her first year in service was to accompany RMS “Queen Mary” to Long Beach, California, where the liner began a new future as a floating hotel. 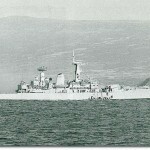 In 1971 “Argonaut” assisted in blockading Rhodesia, which Prime Minister Ian Smith had declared independent. 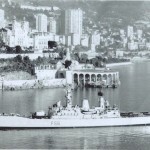 In 1973, the ship saw service as Guard Ship at Gibraltar, followed by a spell being involved in the Icelandic ‘Cod Wars’ on fishery protection duties for around nine months. 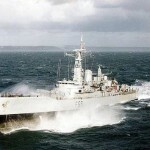 She was modernised between 1976 and 1980, which allowed for ‘a potent anti-ship capability’. In 1981, she was on patrol in the Persian Gulf, and in 1982, “Argonaut”, together with HMS “Ardent” and RFAs “Regent” & “Plumleaf” headed off to Ascension Island (en route to the Falklands) on 19th April, 17 days later than the main task force, which had left Portsmouth on 2nd April. 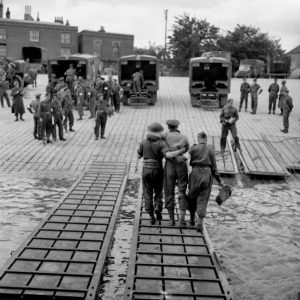 They arrived at Ascension on 29th April, and departed for the Falklands on 6 May. During the action there, “Argonaut” recieved two hits by bombs from an Argentinian aircraft; the bombs failed to detonate, but two crewmen were killed when one of the bombs hit the ship’s magazine, which caused an explosion, which was to be expected. The offending bombs had to be defused, which was carried out successfully, unlike the similar situation on board HMS “Antelope”, in which the bomb exploded, and “Antelope” was lost. After returning home to Devonport, repairs were carried out, and in 1987 “Argonaut” rescued Richard Branson and his balloon, in which he had failed to cross the Atlantic. 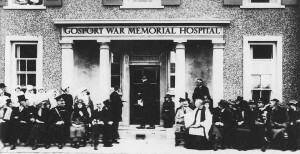 Her last occasion of note was her appearance at the 75th Anniversary of the Gallipoli landings in 1990. 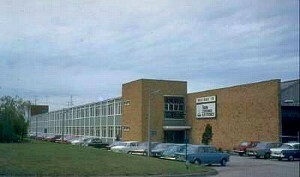 The ship was decommissioned on 31 March 1993, and spent the next 22 months in Fareham Creek, before being towed off to scrap in Spain. 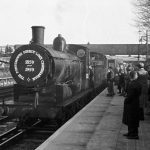 ALSO Today in Gosport’s Past:- on 25 January 1959, the first passenger train seen in Gosport since 6 June 1953 (the last passenger train from Gosport) visited the station in the form of a railtour; ‘The Portsmouth Direct Line Centenarian’ was organized to commemorate 100 years of the line from London to Portsmouth (via Guildford). 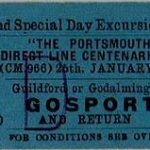 Gosport was the ultimate destination, but the tour, which started out at London Victoria (not Waterloo, which would have been more appropriate, being the terminus of the LSWR), travelled via Stewarts Lane Motive Power Depot, Pouparts Junction, Balham, Wimbledon, Clandon, Guildford, Godalming (old station – the original terminus before the line extended to Havant & Portsmouth), Guildford again, Havant, Fareham, and Gosport. 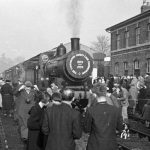 The first part of the tour (to Guildford) was hauled by Adams ex-LSWR ‘0395’ class 0-6-0 30567 (formerly LSWR 3154); 70 of this class were built at Nine Elms Works in 1885/86, but 50 were commandeered by the government in WW1 and sent to work in the Middle East (Mesopotamia & Palestine), and none returned, leaving just 20 of the class at home; 30567 was the last survivor, and was withdrawn from service during 1959 and scrapped. 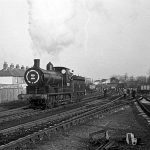 The rest of the tour was hauled by Drummond ex-LSWR ‘700’ (‘Black Motor’) class 0-6-0 30350, built in 1897 by Dübs of Glasgow, there were originally 30 of the class, 29 of which were still in service in 1959. 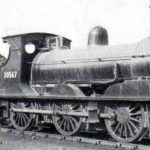 30350 was one of the last 10 survivors, all of which were withdrawn during 1962. None were preserved. 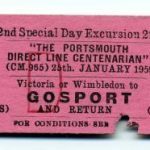 Credits to original photographers, and to John Debens & David Pearson for the tickets from their collections.